John was born in Neath and attended Neath Grammar School and went on to Trinity College, Carmarthen. He taught for many years in the Neath district, mostly at Seven Sisters. He was made a Reader in 1977 in Llandaff Cathedral and served in the Parish of Skewen until 1998. He continued his Reader ministry in the Diocese of Swansea & Brecon at St. Mary’s and later in the new Benefice of Central Swansea. The Bishop licensed him as Lay Minister and he also became Cantor at St. Mary’s, singing most of the choral services. 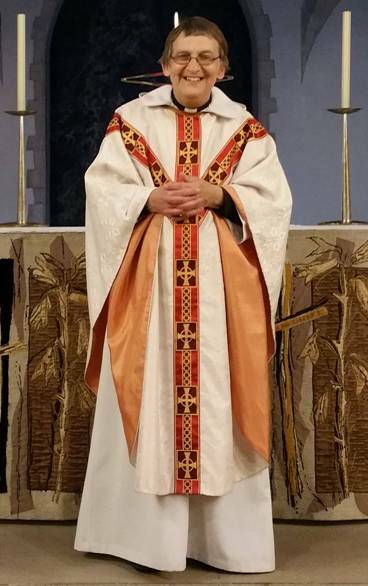 John was ordained deacon in 2015 and priest in 2016 and continues to serve in the Parish of Central Swansea. John is married to Gwyneth. Their son, Ieuan, who was a chorister and bass in St. Mary’s Choir, now lives in Pembrokeshire, where he sings in St. David’s Cathedral Choir. John and Gwyneth both enjoy music, singing together in many choirs.